Tomato season is here! During these next few, short weeks I will be attempting to preserve enough tomatoes to last throughout the year. 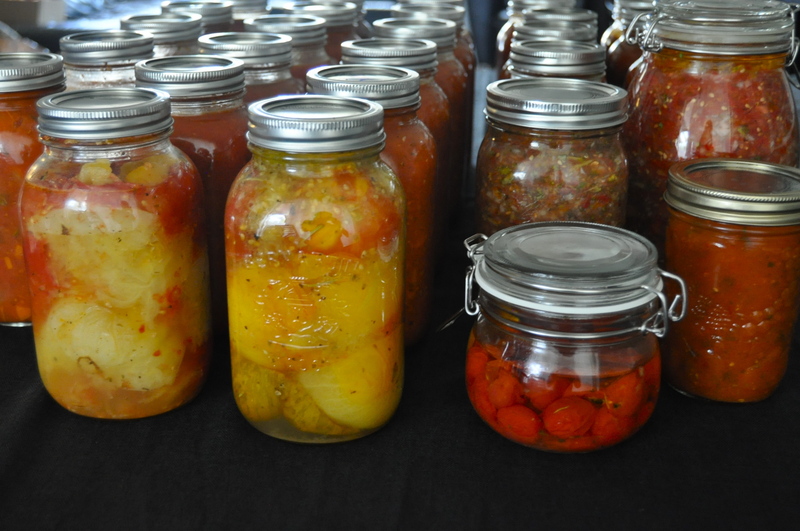 I have been canning for the past few years and really love having those little glass mason jars sitting in my pantry. It makes it so easy to whip up pastas, pizzas, stews, soups, chilis, etc. using produce that has been purchased locally and preserved at it’s optimal freshness. 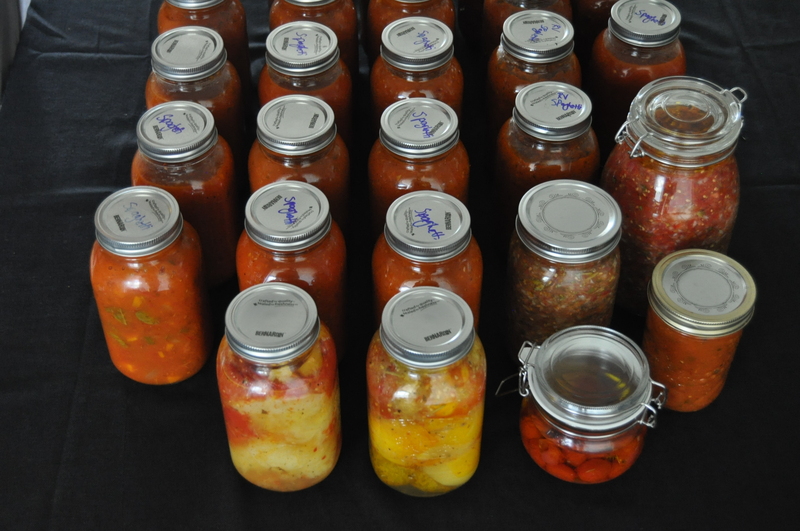 While traditional methods of canning involve multiple steps of blanching and peeling your tomatoes before canning, my method is quick and simple. While there are a few steps involved, they are simple and do not require much active effort (especially in comparison with the traditional way). 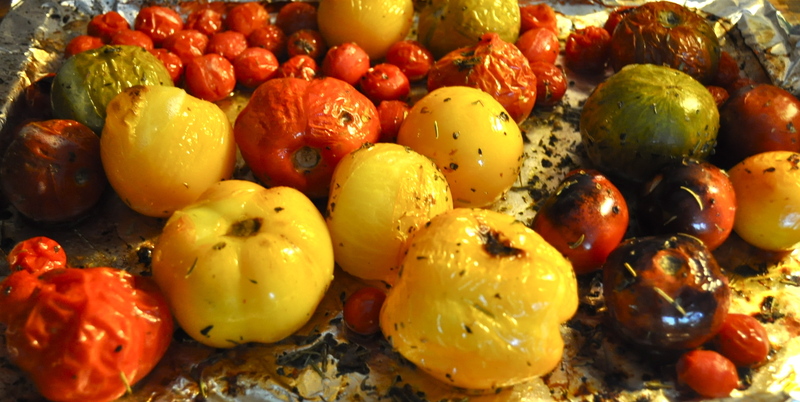 I find roasting the tomatoes emphasizes and concentrates their sweet flavour, making them taste even more delicious. Pop your tomatoes under the broiler and watch them closely. 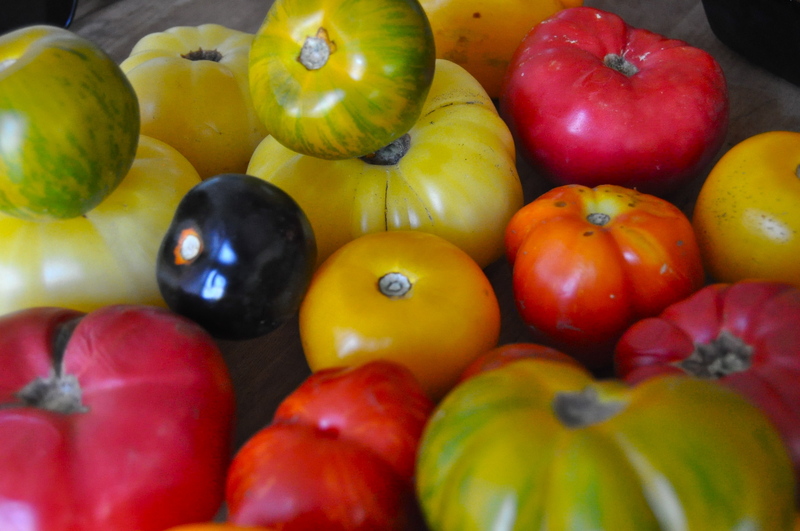 Broil them until brown spots begin to appear on the tomatoes. Remove from the oven, flip, and place back under the broiler. After tomatoes have brown spots on all sides, remove from oven (tomatoes may be beginning to split). Arrange your sterilized mason jars. Jars can be sterilized by running through the dishwasher or placing in boiling water for a few moments (I do this in my canner as it is pre-heating). This is the only time you should ever use the bottled stuff. I always feel like a criminal buying it, however it is necessary for canning as the acidity is constant (the acidity varies in real lemons) and prevents spoilage. Pack your roasted tomatoes into your jars. They should be oozing juice. Push the tomatoes down so that the juice covers them. If you’re feeling fancy you can add a couple of fresh basil leaves to each jar. Leave 1 inch of headspace. Screw the lids on. Boil the jars for 40 minutes in either a water bath canner, or a large pot. Carefully remove the jars after 40 minutes and set aside to seal. You may hear the jars “pop” shut as they cool, which indicates a seal. Once tomatoes are cool, push the centre of the lid. It should be solid. If the lid still pops back and forth the jar did not seal (this has never happened to me, it’s pretty uncommon). You can either eat this sauce immediately or re-try with a new lid. Canned tomatoes will sit happily in your cupboard for the year. This entry was posted in canning/preserves, vegan, vegetarian and tagged canning, dairy free, easy, gluten free, healthy, nut free, recipe, roasted tomatoes, the easiest way to can tomatoes, vegan. Bookmark the permalink. Thank you ❤ Glad you enjoyed it!